The Arab world is slowly wakening up to the fact that it was Israel that toppled Mubarak. The Resurrection of Hosni Mubarak. Rememeber how the West wrecked Yugoslavia? The West is now wrecking various Moslem countries, by causing ethnic and religious conflicts. The West is trying to break up the 'Greater Middle East', according to Knut Mellenthin. 1. Israel wants countries such as Syria and Iraq broken up broken up into several states. There will be a Kurdish state. 2. In 1982, Oded Yinon had an article published by the World Zionist Organization journal Kiwunim, entitled "A Strategy for Israel in the 1980s." "An Iraqi-Iranian war will tear apart Iraq..."
"A Coptic State in Upper Egypt alongside a number of weak states with very limited local power and without a centralized government is the key..."
All Arab and Muslim states would face "ethnic and social destruction from within, and... raging civil war." Yinon explicitly mentioned in this context, Turkey, Iran, Afghanistan and Pakistan. 3. Numerous policy papers published in Israel follow the Yinon line. There were references in these to "violent action against Syria, Turkey and Jordan, among others..."
4. 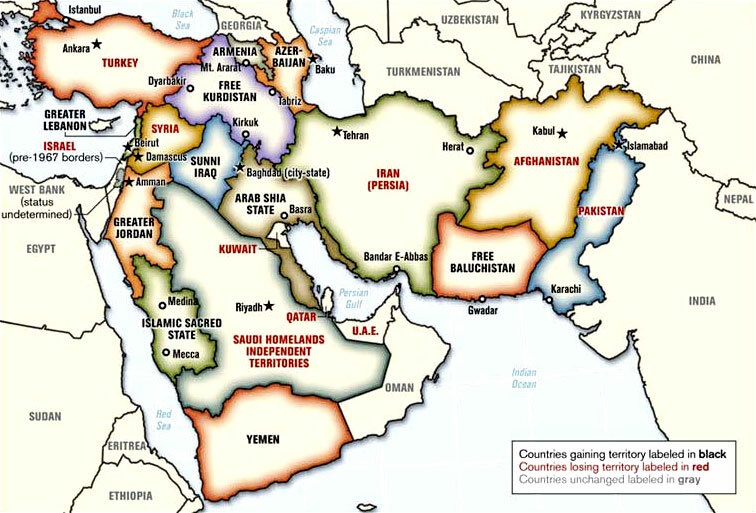 In June 2006, the U.S. military's Armed Forces Journal published an article by Ralph Peters suggesting drawing new borders in the Middle East. "The objectives of 'Yinon Africa' are to balkanize the continent on three lines: ethno-linguistics, skin color and religion. "In the Congo, where a catastrophic genocide has been occurring since 1996, in which up to 10 million people have died at a maddening rate of 1,500 a day, the profiteers of this downright insidious humanitarian disaster are almost exclusively Jewish and intimately linked to the larger network of international Zionism that has been responsible for every major conflict of the last century." Good work. The more people know about Yinon the better. It's my opinion that if Yinon had the same public recognition as Tsarnaev (say) the world would be a very different place. Frankly you'd have to wonder why the Imams don't spend their evening prayer sermons explaining the nature of the Yinon plan to their followers. "Do not fall for their lies" kind of thing. Being charitable, one would like to think that this is because they've never heard of the Yinon plan rather than them knowing all about it and then keeping it from everyone else. Greater Jordan? Puh-leeze. Try Eretz Israel.